Defendant pled last week to shooting a neighbor's cat in the head with a BB gun. He was sentenced to 3 days jail with credit for 3 days time served, ordered to complete 2 years probation, Impulse Control and Anger Management classes, have no harmful contact with animals, complete 50 hours of community service, and possess no weapons. This was a felony case before Judge F. Rand Wallis. The prosecutor assigned to this case was Katherine Drummond. Ocoee PD served a warrant on 9/16/09 and found Shye (pictured below with her new owner, Animal Services Officer Laura Tuttle) and two other dogs in a dark, blazing hot garage covered in feces and urine with no ventilation, no food and no water. The dogs were starving and were eating the gym equipment in the garage to try to survive. There were claw and teeth marks on the doors from the dogs trying to escape their conditions. The animals were covered in sores and fleas, emaciated, dehydrated and Shye had cigarette burns on her. The other two dogs, Lexie and Ice, declined in health and had to be euthanized. Shye was adopted by Animal Services' investigating officer, Laura Tuttle. Shaw was convicted of both misdemeanor counts today and sentenced to 6 months jail on each charge - to be served consecutively - by Judge Nancy L. Clark. This is another case where we see the link between animal cruelty cases and other abuse. 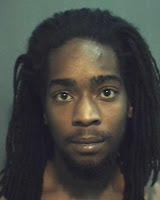 Shaw is currently awaiting trial (scheduled for June 14, 2010) on charges from 9/11/09 of Attempted 1st Degree Murder w/Firearm, Aggravated Child Abuse, Aggravated Battery, Possession of Firearm by Convicted Felon, Throw Deadly Missile at or Within Building, Aggravated Assault w/Firearm and False Info to Law Enforcement Officer re: Missing Person or Felony. Kudos to Orange County Animal Services, Assistant State's Attorney Rafael Rodriguez, and Judge Nancy L. Clark. Should be teaching lessons to those abusive person. Animals should be treated well. Would You Try to Help a Battered Woman? ". . . An accident. . ."